A huge shout out to our latest WomensNet.net Amber Grant Winner, Robin Major from Minneapolis, Minnesota. Robin is one of the principals of Stone’s Throw Urban Farm. We hope you take a few minutes to read her interview below. We fell in love with her passion and business sense – and we’re sure she will inspire you! WN: Congratulations on winning the November Amber Grant! RM: Thank you! We are so honored and so excited to be recipients of the Amber Grant! The Amber Grant provides much needed opportunities to women entrepreneurs who face many challenges besides funding — culture, history, families, etc. Thank you again for everything you do. WN: What inspired you to create Stone’s Throw Urban Farm? RM: To be honest I never thought I would farm in the city. I thought farming in the city was “fake” farming, unrealistic, and for people who didn’t really know the realities of farming. I started farming in the city as a side project and as a stepping stone to eventually farm outside the city. However, the longer I worked and spoke to neighbors, community members, and other farmers, the more I was excited by the challenges and the potential. I began to think more about the bigger picture of why I farm – and what vision I want to work towards. I hope that our project is one small step towards a more equitable food system. WN: How did you actually launch the business? RM: Stone’s Throw Urban Farm began in 2011 when three urban farms (I ran one of those farms) merged together to combine resources, market, and land, to build a more lucrative and comprehensive business. In the spring of 2012 we ran a $15,000 kickstarter to buy our truck, trailer, and equipment. Since the kickstarter we have primarily relied on selling vegetables to pay for our labor, insurance, equipment and other supplies. Over the last two years we also received two small research grants. WN: Tell us a bit about your business partners and the vision you all share. RM: There are three partners — Alex Liebman, Eric Larsen, and me. Alex and I work full time on the farm and Eric works ¾ time. We all have our own administrative realms of the business, but share the visioning and much of the physical labor. We have weekly volunteers who help out on the farm and they play a large role in keeping us excited and motivated. We are committed to developing a business with a triple bottom-line: financial sustainability, improvement of the ecological health of the land we farm, and on-farm education and community engagement. I farm in the city because I enjoy the complexities and challenges that it brings. I believe everyone, people of all races and backgrounds, have a right to eat and grow their own food and I believe farming in the city is one step towards a more equitable food system. WN: How have city officials responded to your business? RM: Some city officials have been incredibly supportive, some have been neutral, and some have complained. We farm in both Minneapolis and St. Paul so we work within two different city governments. Overall, both Minneapolis and St. Paul have done wonderful things towards allowing urban agriculture to exist in the city — we have access to water from fire hydrants, and we can sell food from our lots. However, there is a difference between allowing urban agriculture and fully endorsing it. 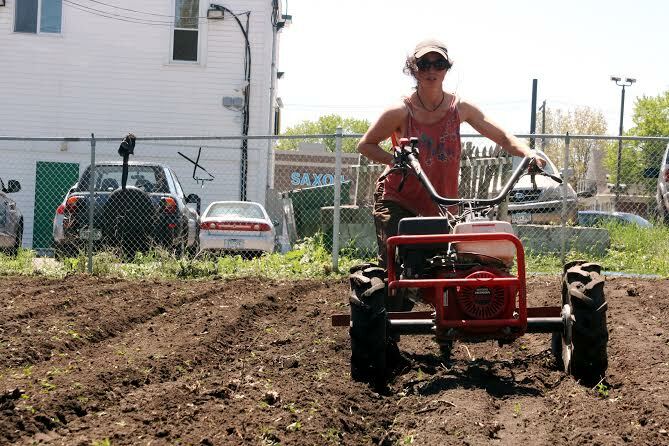 Currently, land that is farmed on vacant lots is viewed as a place holder — an activity that occurs while the city waits for something with better tax revenue to take its place. City development and urban agriculture do not have to be at odds with each other; to make urban agriculture a permanent fixture in these cities it must be built into the planning and infrastructure of the city. WN: What has been the response of city residents — particularly the underprivileged? RM: Hundreds of people walk by our plots every day. Many do not look around, many do look and keep walking, and a few slow down and throw out a question or stop and chat. The feedback is primarily positive, “what is that big green thing?” or “thank you for making our neighborhood beautiful!” People like good, healthy food and know it is important. We do our best to respect our neighbors, to be welcoming and non-judgmental and to learn from the people around us. However, we are a farm business and the market constraints limit our ability to provide more food for the low-income community. We are a young business with a complex model and we have many flaws to work through. Our intention is to work with community members and the city to build a food system that provides fresh, local food to all people.